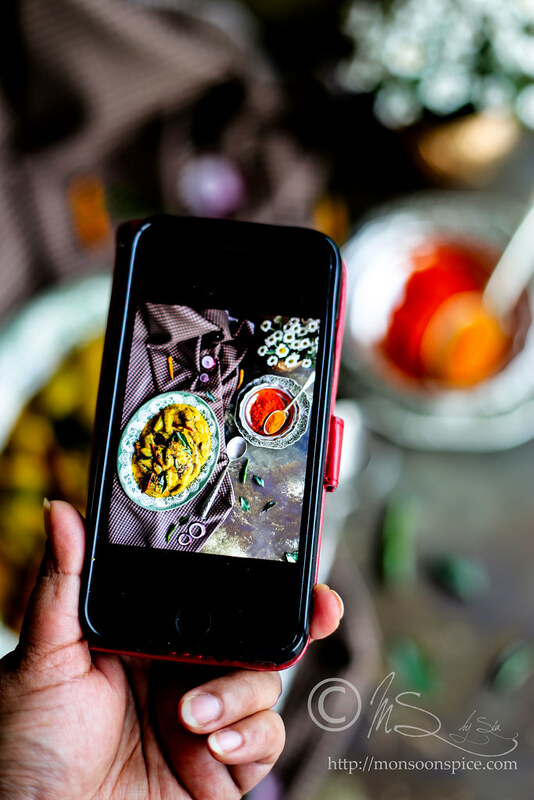 Time and time again I am on a self-created mission of learning, developing and sharing recipes which you will never find in any Indian restaurants. These recipes are lovingly created, tweaked and then perfected after many trials and errors by the home cooks and are passed on from one generation to the next with in a family. They are fiercely guarded like some precious treasures and most often, never shared with someone outside their family! So if ever by any chance someone outside the family asks for the recipe, you can be rest assured that only a part of these treasured family recipes will be shared…And oh, half-heartedly! When someone says, “Oh, it’s quite simple you know. You need a handful of this and a spoonful of that. Grind them all and cook with the vegetable!”, you can be sure that the finished dish will never come close to the one you fell in love with. Consider yourself lucky to have had a privilege to taste such family heirlooms and be mindful of their uneasiness to share their family’s secret recipe. A decade ago, I was invited for a lunch by a friend of mine. Students who live in a hostel will know what it means to be invited for a home cooked meals when one has to eat bullet proof roti dipped in watered down red chilli paste with 2-3 chunks of sorry looking vegetables that was passed as a ‘curry’! 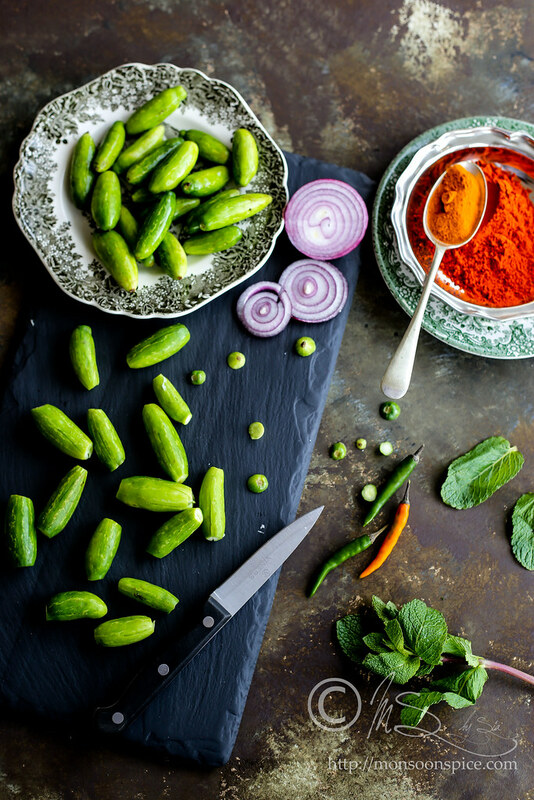 My friends family were originally from a southern Indian state of Andhra Pradesh (now divided into two states of Andhra Pradesh and Telangana) which was known for their amazing regional food and fiery hot pickles which enslaves your taste buds the moment it touches the tongue. 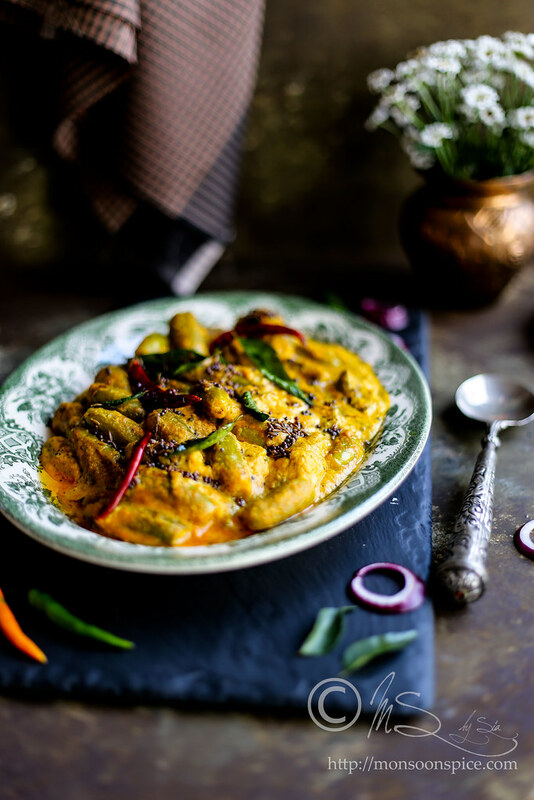 On that particular day, my friends mother had lovingly cooked a festive thali and one dish that made a big impact on my taste memory was the Vegan Tindora Masala Curry where ivy gourds were cooked in a creamy peanut and coconut gravy. Back then my interest in food was limited to eating than cooking, but to show my appreciation I asked her for the recipe. To my pleasant surprise, she gave me the recipe but also mentioned that she had left one ingredient from the recipe as it was their family’s treasured secret recipe. The recipe jotted down in a piece of paper had the list of ingredients and cooking method, but as with most Indian cooks the ingredients were not an exact measurement but more of a pinch of this and a handful of that and it is a struggle to recreate the culinary perfection that is a mother’s cooking. The old school technique of estimation or ‘andaaz’ is so rooted in our culinary history where we keep experimenting with quantity of ingredients used in cooking, until it creates perfect harmony between flavour, aroma and taste buds. Our Indian mothers and grandmothers may not abide by strict teaspoon, tablespoon or cup measurements; but it is perfected art which adds a special magic touch to every dish making it irresistible and absolutely delicious. I stumbled upon this lost recipe when holidaying in India last August, hidden in between the pages of my diary where I used to jot down quotes and poems by famous and not so famous people that touched my heart and meant something to me. One look at it and the memories came gushing down like the monsoon rains outside the window. I sat down and tried to remember the missing ingredient in that recipe, straining my brain and palate. My taste memory failed me that day. I cooked the dish not once, not twice but 6 times, following the recipe and then tweaking it with new ingredients, the dish tasted better and better but it still didn’t come close to the one my taste buds remembered. Then one day when plucking the mint leaves it struck me that this may be one of the missing ingredient and decided to use it in the recipe. Lo and behold, it indeed was the missing ingredient which made me experiment with the same recipe at least half a dozen time! 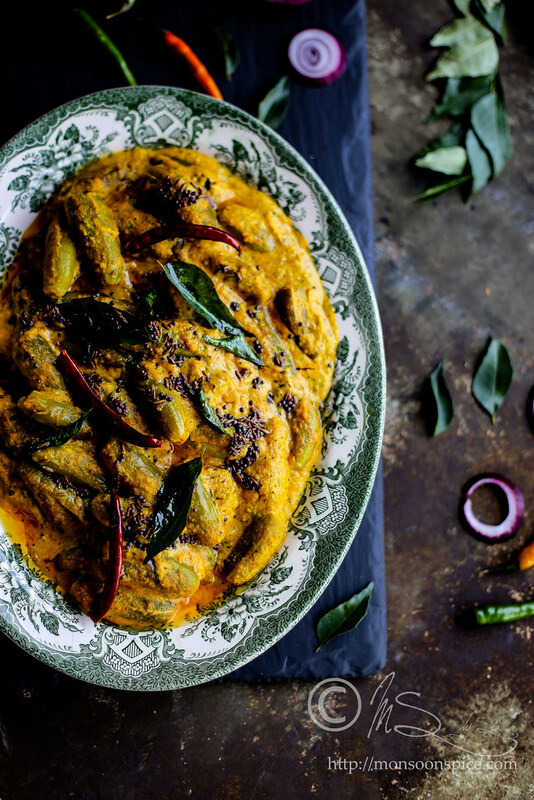 It was mint leaves that added freshness to the curry and the dish was finally very close to the I remembered. I am not claiming that I have finally nailed the dish, but I am quite happy (and little proud of myself) as this Tindora Masala Curry is sooooo good that we all ended up licking our fingers! 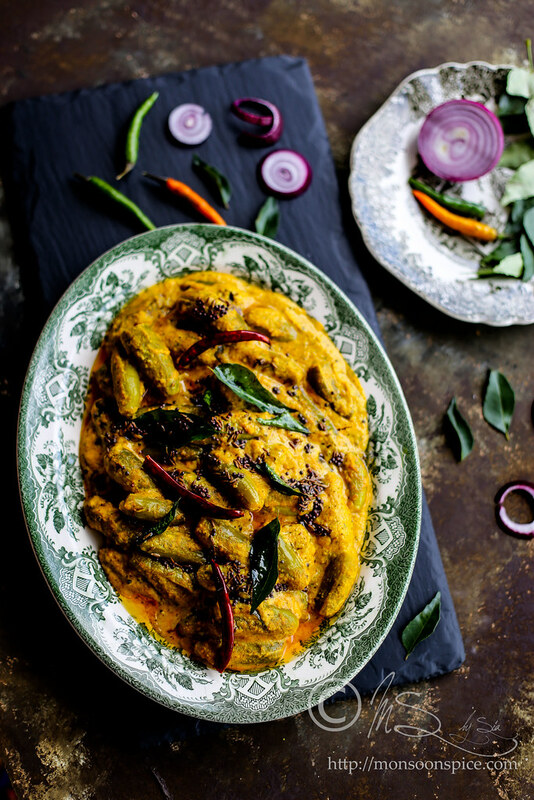 Unlike other curries, this Tindora Masala Curry has nuttiness from peanut and sesame seeds, creaminess from dried coconut or kopra/kobbari and freshness from mint leaves. 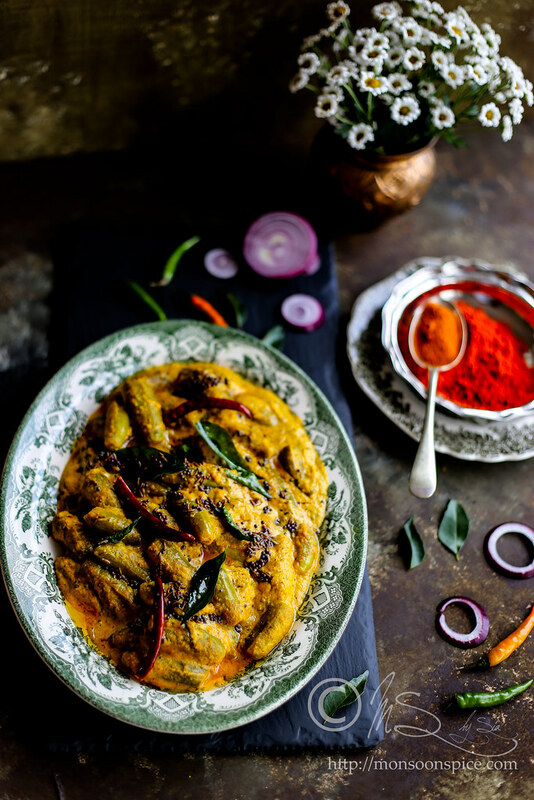 The spices used are very basic ones which help to enhance the flavour rather overpowering it. I have also added little bit of jaggery (unrefined cane sugar) and tamarind which gives a tangy sweetness and helps in balancing the flavour. 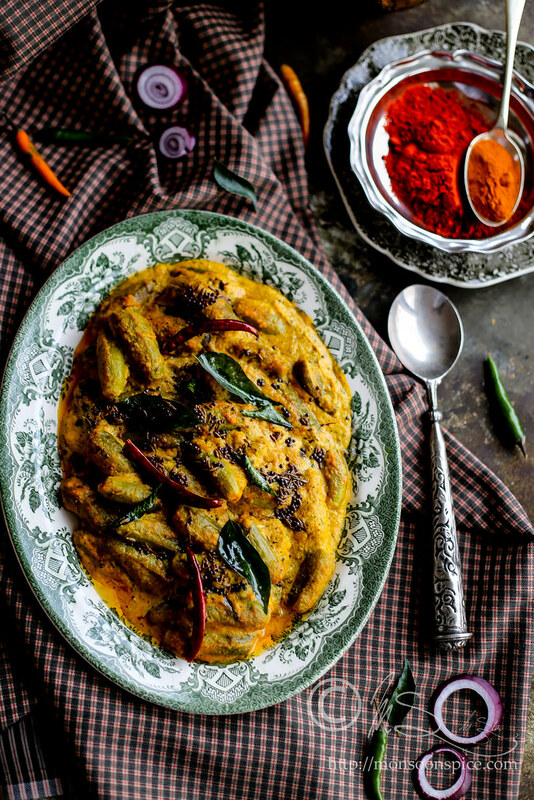 But the star of the dish is the crunchy Tindora (Ivy gourd or tindla or tondekayi) which is one of my most favourite vegetables of all time! This recipe works great with baby eggplants and okra as well. 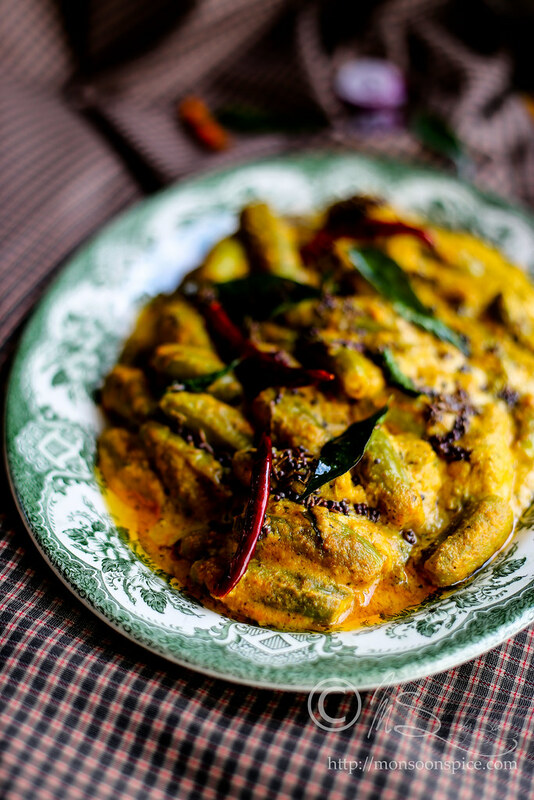 Just replace tindora with okra or sliced baby eggplant and stir fry them with tadka before adding the ground paste. 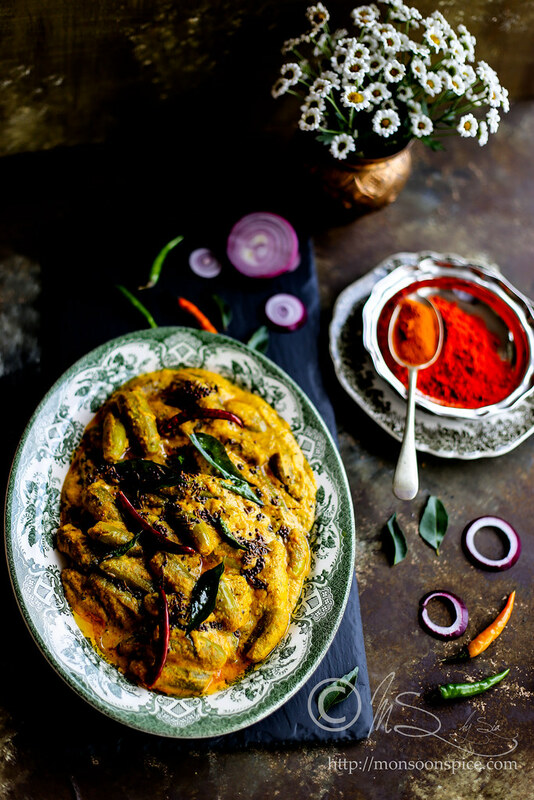 I personally prefer to serve this Vegan Tindora Masala Curry with freshly cooked phulka or chapatti, but it also goes very well with other Indian flat breads like akki rotti, ragi rotti, naan and dosa. Trim the ends of tindora or ivy gourd and slit it in the centre half way. Make another slit vertically so that the slits make ‘+’ mark. Do take care not cut too deep as we need the tindoras whole or intact. Take these tindora in a pressure cooker or in a pan and add about 2 cups of water. Next add 1 gooseberry sized tamarind pulp, jaggery, ½ tsp turmeric powder and about a tsp of salt. Close the lid and cook it for 1 whistle, or for about 8 mins, on medium flame. It will take about 12-15 minutes if cooking in a pan tightly closed with a lid. Let the pressure release completely before opening the lid. Drain the water from cooked tindora and keep it aside. Discard the tamarind pulp and preserved the cooked water to be used later for the gravy. While the tindora is getting cooked, prepare the ground masala for the curry. Dry roast peanuts until they are roasted, about 2-3 minutes, on medium heat. The skin of the peanuts turn brown and they make popping sound when they are roasted. Transfer the roasted peanuts to a clean and dry plate. 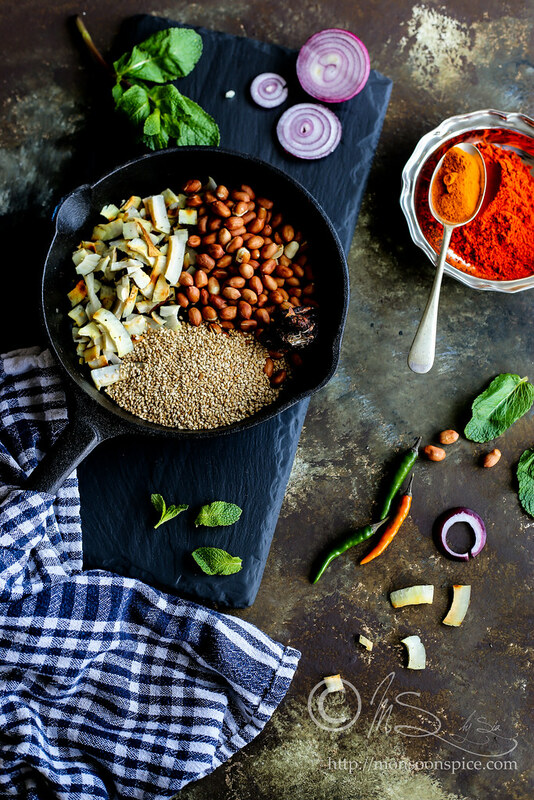 Bring the pan back on to the hob and add sesame seeds. Dry roast them until they change their colour to golden, about 1-2 minutes. Transfer the roasted sesame seeds to the plate along with roasted peanuts. Next dry roast the dry coconut slices or desiccated unsweetened coconut on medium flame until they turn golden brown. The desiccated coconut will take just about a minute or two, but the dry coconut or kopra slices takes little longer, abut 2-3 minutes, to roast and change colour. Transfer the roasted coconut to plate. Heat about ½ tbsp. of oil in a pan and add green chillis. Fry them for a minute and then add thinly sliced onions. Fry them until they turn golden brown, about 2-3 mins. Next add mint leaves and sauté until they wilt. Turn off the heat and let it cool down to room temperature. Transfer roasted peanuts, sesame seeds and dry coconut into a mixer jar or food processor and grind them to powder. To this add fried onion, green chillis and mint leaves along with tamarind pulp and about ¼ cup of water and grind them. Scrape the edges of the mixer jar and add 1-2 tbsp of water and grind the ingredients to smooth paste. Keep it aside until needed. Heat oil in a pan on medium flame. Once the oil is hot, add the mustard seeds, cumin seeds , dry red chillies, curry leaves and hing. Fry them until the mustard seeds starts to sizzle and pop, about 1 minute. Add the ginger-garlic paste and fry it until the raw smell disappears, about a minute or two. Add turmeric powder and red chilli powder and give them a quick stir. Next add the ground paste and give it a good stir for 2-3 minutes. Make sure that you keep stirring the paste so that it doesn’t stick to the pan. The idea is to make sure that all the spices and ingredients are properly cooked and don’t give that raw taste to the gravy. Add the cooked tindora along with the water in which its cooked. Add salt to taste and mix it well. If you find the gravy too thick, add little more water to get desired consistency. Don’t worry if you find the gravy thin, as the ingredients like peanut, onion in the gravy will thicken as it cooks. I personally prefer the gravy to be little thick when serving with rotis. Cover the pan and let it cook for 10-12, stirring in between, so that tindora absorbs all the flavours as it cooks. Add garam masala and cook it uncovered for another 2-3 minutes before turning off the flame. Cover and let it rest for 30 minutes for the flavours to blend. Reheat the Vegan Tindora Masala Curry before serving it hot with Indian breads of your choice. Enjoy! Take extra care when roasting the sesame seeds as it can quickly burn and make the gravy taste bitter. If you cant get hold of sliced dried coconut or kopra, replace them with dessicated coconut. Please do bear in mind that it will take about 1-2 minutes to roast the desiccated coconut to golden brown. This recipe works great with baby eggplants and okra as well. Just replace tindora with okra or sliced baby eggplant. Instead of pressure cooking them, stir fry them once you make the tadka and before adding the ground paste. 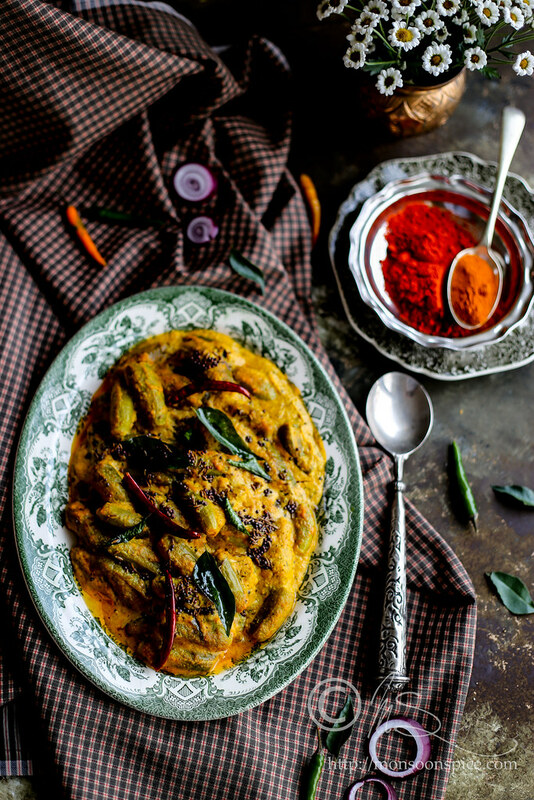 I personally prefer to serve this Vegan Tindora Masala Curry with freshly cooked phulka or chapatti, but it also goes very well with other Indian flat breads like akki rotti, ragi rotti, naan and dosa. So ein großartig Rezept und ihre Fotografie ist traumhaft!! !